With the current increases in the cost of oil and gas, a wood (or dual fuel) pellet stove or fireplace insert is a good alternative source of heating for your home. However, as with any wood stove or fireplace purchase, there are several things to consider before you make your pellet stove purchase. Adding any type of wood-burning heat stove to your home can slightly increase your insurance rates, but not informing your insurer can void your coverage in the event of a fire. Before buying, obtain a stove clearance diagram from your insurance company. This will detail the amount of space you must ensure is between your pellet stove and nearby furniture, floor coverings, draperies, and walls. Follow these installation guidelines and return the completed form to your insurance company for approval. Your insurer will be more likely to approve this installation if it was installed by a trained specialist. They may also want it to be inspected (at your expense) before approval is given. Every area has fire/building code restrictions regarding wood stoves and these also usually apply to wood-burning pellet stoves. Review and follow these guidelines for a safe installation. Your authorized pellet stove dealer can confirm the best place to install the heating unit, what accessories you'll need and how it will be connected. Discuss possibilities and preferences. Bring indoor/outdoor pictures to ensure a trouble-free installation, or arrange a home visit with the installer. Try to negotiate a free installation for the stove you are buying, if possible. If there are various placement options, consider access to pellets (how far to carry bags), congestion in the room beyond the clearances, and how the heat will circulate to the rest of your home. You'll also need a standard 110 volt AC electrical outlet close to the stove. Though actual purchase and installation prices differ per area, expect an initial outlay of $2,000 to $3,000 plus installation and accessories for a pellet stove. A dual-fuel pellet stove, which burns wood or other fuels (corn, cherry pits etc) will cost more. Be prepared for additional costs for delivery, insurance inspection, protective floor pad and connection piping and accessories. Some pellet stoves have a direct-vent type of connection to the outdoors and do not require a full above-the-roof insulated chimney system. This type can cost much less to install. Review all possible hook-ups to ensure everything goes well with the install. A large hopper is worth the extra cost - you'll fill it less often, so it's a good feature to have. Wood pellets cost around $4 to $8 and most come in 40 lb bags. ​Cost will vary with availability and type of wood used for the pellets. Check on price and availability in your area of corn or other fuels before buying a dual stove. How many bags of pellets you'll use over the heating period will vary on type of pellet, stove setting and climate. For example, we have used a pellet stove for several years burning one bag of wood pellets per day, on the lowest setting. Our average annual usage was about three tons over approximately six cold months. Cost can be considerable if your winter season is very long. Pellets are often sold in 40 lb plastic bags and this weight can be a constraint for many. Bags will need to be hauled from storage to the stove every day (or two) and poured into the stove's hopper. Pellet bags can be stacked but must be stored in a dry place indoors or in a garage/shed. They must be kept dry as dampness will cause pellets to swell and they will not feed properly through the drop mechanism in the stove. Try to negotiate pellet delivery to your home, and there may be cost savings buying by the ton. 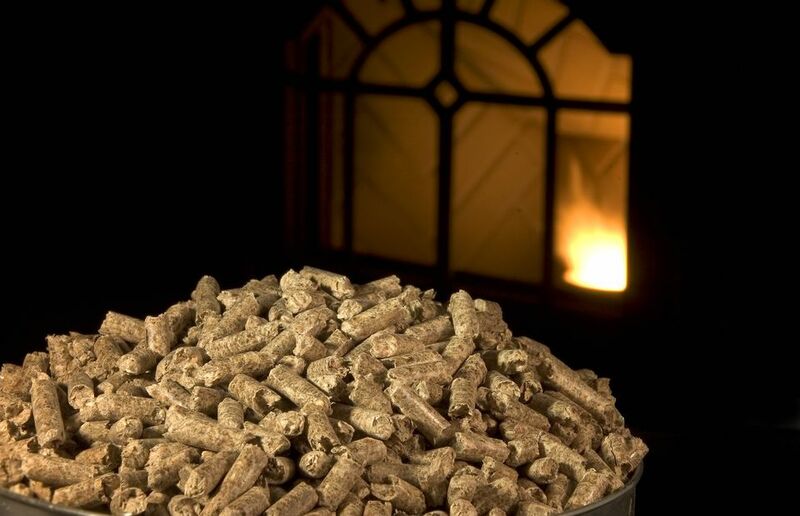 Wood pellets are made of sawdust and switch grass, and the type of wood will affect burning efficiency. Pellet stoves are easy to start and maintain. Ash build-up is minimal but the stove will need regular cleaning. Follow the manufacturer's guidelines for when and how to clean your pellet stove. A shop or ash vacuum works well for this cleaning, but the wood ash must be cold. Pellet stoves do get hot on the outside when operating, use care when near and never leave anything on top of the stove. Burning wood pellets is much cleaner than burning wood in a wood stove. There is no bark or wood chip mess, no firewood stacking and no smoke residue that accumulates on walls and ceiling. The biggest constraint is buying, hauling and storing pellet bags. Pellet stoves produce a very comfortable and dry radiant heat with efficient BTU's. Choose a model of stove that is recommended for your size of home. Operating noise is minimal. To operate, pellets from the hopper are either pushed by an auger or gravity fed into a fire chamber where they burn and produce heat. This heat is radiated out to the room from the stove to the surrounding area. The idea is to keep the hopper filled. When it is empty, the stove will shut down automatically. To help circulate that warm air throughout the room, use a heat-powered fan on the heat stove. These are non-electric and are very efficient to directing heat to warm up the room. When power is interrupted, the stove will automatically and safely shut down. A power surge or slight interruption may or may not affect operation. Since a pellet stove must be pellet-fed usually on a daily basis, when planning on being away from home for several days, you must make arrangements with someone to feed the heat stove regularly. Follow recommendations as to size of stove for your home. A stove that is too large, may burn too hot even on low and can result in a waste of fuel and money. The size of hopper will dictate how often you have to fill it. Confirm availability of parts, warranty and service. When buying a pellet insert, confirm that the stove can be connected with the existing fireplace chimney and liner. Always have a trained specialist install a pellet stove or insert for a safe, approved operation. Pellet stove durability is generally very good and these units have long expected lifespans, with minimal downtime. The pellet stove featured is the Castle 12327 Serenity Pellet Heat Stove with Smart Controller. With five feed rates, this unit has adequate speed controls and a large (2800 sq. ft.) capacity for whole home heating.